Cloud Computing PowerPoint templates, backgrounds Presentation slides, PPT Themes and Graphics. In today’s time cloud computing has become one of the essential components of data sharing in most business houses and organizations. These templates from SlideGeeks.com will ensure that your entire team including the top management has thorough knowledge about the working of cloud computing. With these presentations you can explain the various advantages of this latest advancement in technology. You can mention how this wireless concept of data sharing can lead to cost cutting and can help save time and efforts of the employees. You can also mention how data loss and data corruption can be prevented using this method since this includes the practice of using a network of remote servers hosted on the Internet to store, manage, and process data, rather than a local server or a personal computer. You can include a list of top 10 cloud providers and also mention the leading organizations that are already using this technology. Right from the basics of cloud computing to the more complex systems and steps involved, all can be showcased and explained using these amazing PowerPoint presentations that will help you hold the audience’s attention while you educate your audience about everything and anything concerning cloud computing. These templates can also be further customized after downloading to match the taste of the presenter. 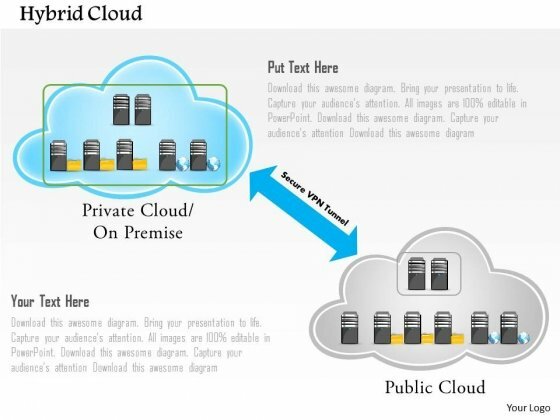 This PowerPoint template contains graphic of hybrid cloud with public and privet cloud networks. You may use this PPT slide to exhibit how a VPN tunnel works. Use this technology template design to illustrate your ability. Our Hybrid Cloud With Public And Privet Cloud Networks And VPN Tunnel Powerpoint Template will extend a hand. They provide all the assistance you desire. Our above PPT slide contains graphics of cloud with technology icons. This PowerPoint template may be used for project related to cloud computing. Use this diagram to impart more clarity to data and to create more sound impact on viewers. Do not let oppurtunity go abegging. 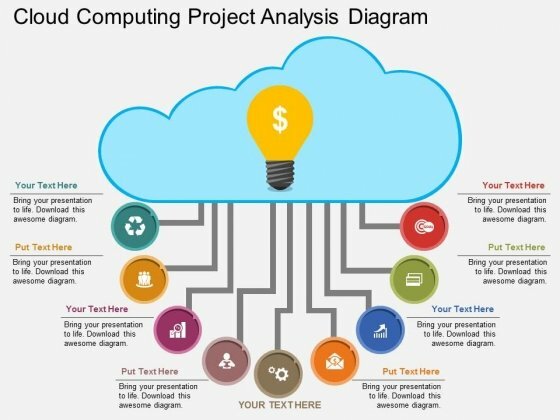 Seize the moment with our Cloud Computing Project Analysis Diagram Powerpoint Template. This PowerPoint template has been designed with graphic of desktop and cloud. 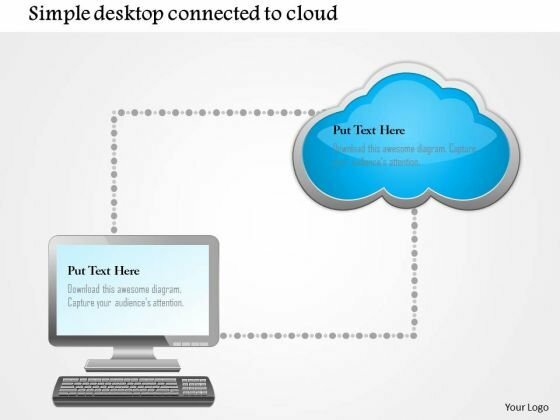 This PPT slide depicts the concept of cloud computing. Use this diagram for your cloud technology related presentations. 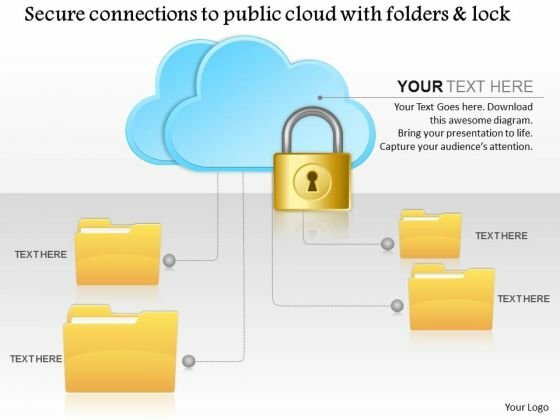 This technical slide has been designed with graphic of folders and cloud with lock. This PPT slide depicts the concept of secure connections. It focuses on the data safety in cloud technology. Use this diagram for data safety related presentations. 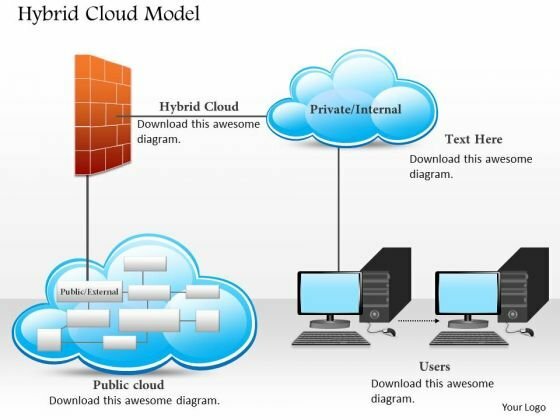 This technology diagram slide has been designed with graphic of hybrid cloud model. This slide depicts the concept of cloud computing for user benefit. Display private and public user benefits of cloud computing. This image slide displays public or private cloud or hybrid cloud computing benefits. This image slide has been designed with graphic of big cloud surrounded by small clouds. This image slide depicts cloud computing. You may change size, color and orientation of any icon to your liking. Use this PowerPoint template to express views on networking and technology in your presentations. This image may be used to explain various concepts of cloud computing in your presentations. This image slide will impart professional appearance to your presentations. 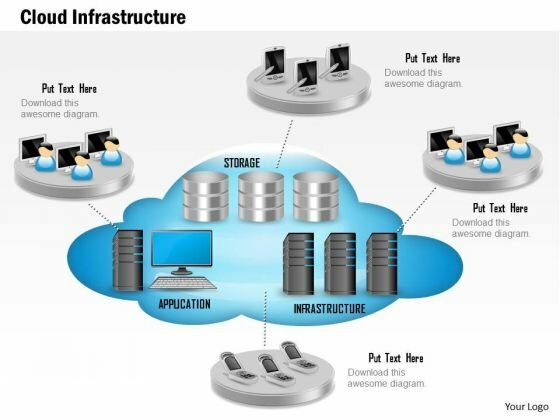 This image slide displays cloud infrastructure depicted with application, storage and servers. This image slide has been crafted with graphic of cloud with application, storage and infrastructure icons. Graphic of various technology devices has also been used in this image. This image slide depicts cloud computing infrastructure. You may change size, color and orientation of any icon to your liking. Use this PowerPoint template, in your presentations to explain concepts like cloud computing, technology and business. This image slide will help you achieve your goal of making professional presentations.